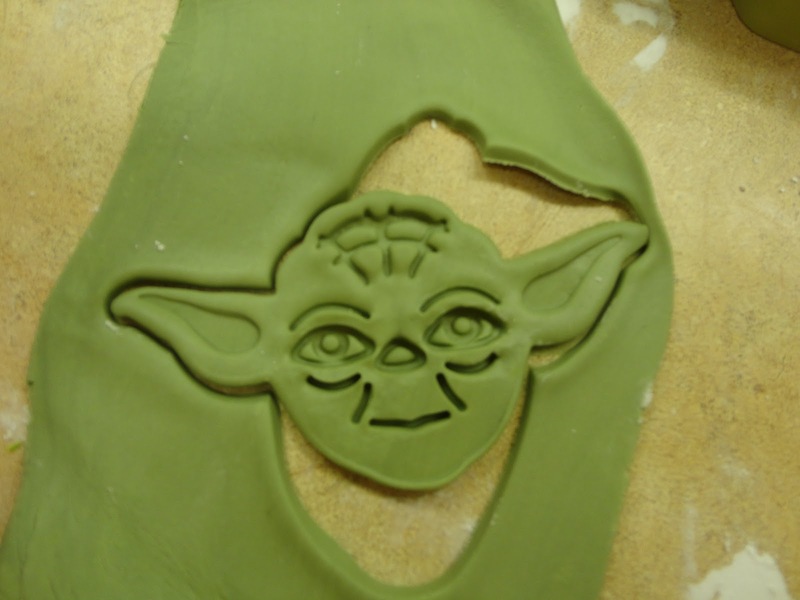 Yoda is a really easy cupcake topper to make. It requires only a few tools and you can make it as life like as you want or just leave it plain and it still looks good. 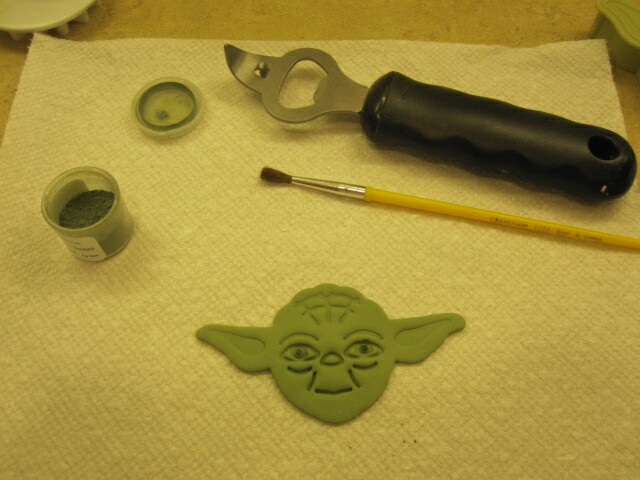 The Yoda cookie cutter from Williams-Sonoma . Either a black food coloring pen or black food coloring, a tiny paint brush, clear vanilla, a little bowl or something to hold the paint. Petal Dust in a Dark Green color (I used Moss Green petal dust) and a paint brush for the petal dust. 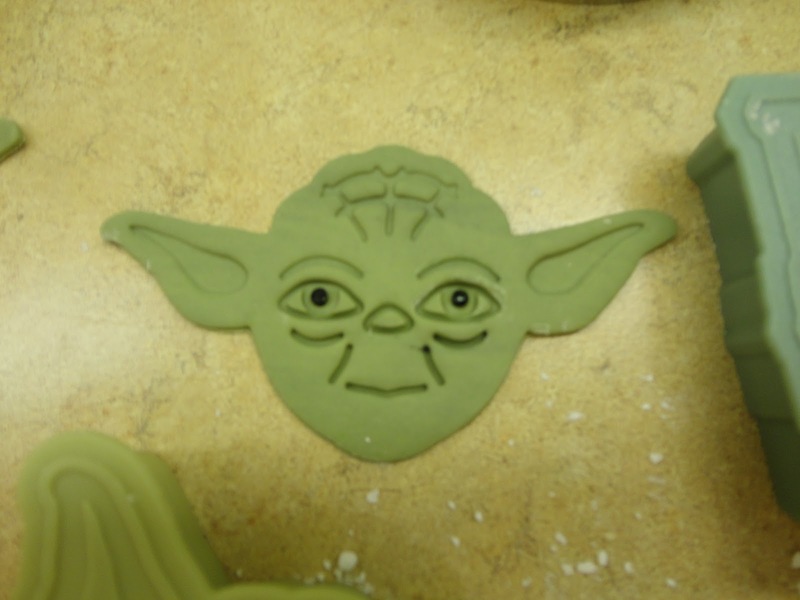 A circle cookie cutter the size of your cupcake or just big enough to fit the yoda on it. 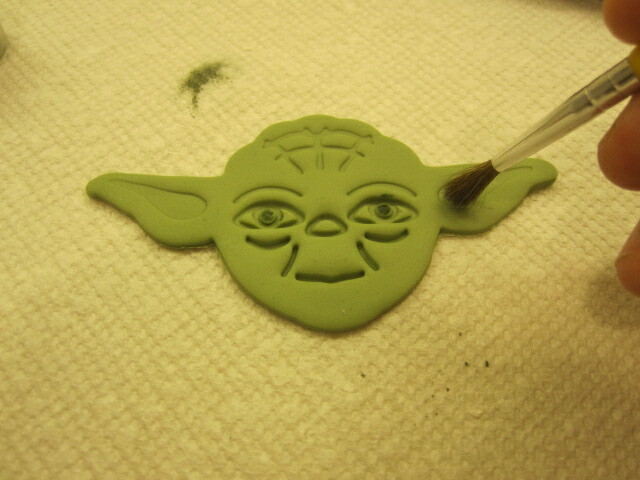 Then use your food coloring pen or paint on the pupil on Yoda’s eyes (I painted mine since I already had the black food coloring from painting the stormtrooper. Open your petal dust on the paper towel with a bottle opener (if you use your fingers it is really hard so I use a bottle opener to open my petal dust and luster dust bottles). 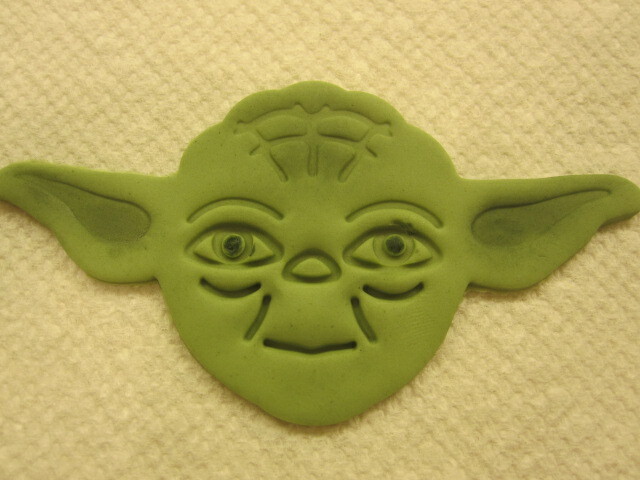 Make sure Yoda is on the paper towel so the dust doesn’t get on your work surface. Use a dry paint brush to dip into the petal dust and just get a little bit on the brush. Then I tap the paint brush in the lid of the petal dust so that the excess comes off then a tiny tap on the paper towel and then on Yoda. I know that sounds odd and like a lot of tapping, but if you have too much on your brush it will make splotchy marks on Yoda. I start with the inside of his ears and sweep out to the outside of his inner ear. 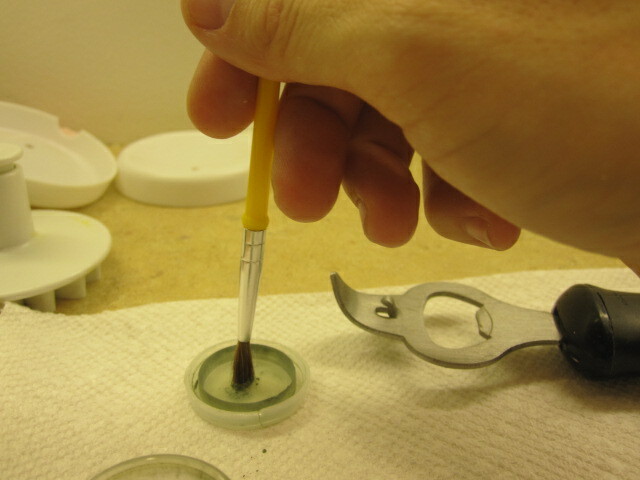 Oh, and I like the fluffier paint brushes instead of the stiff bristles, but a smaller paint brush. Then you can tap the paint brush back in the lid and pick up some of that dust and then a little in the grooves of his forehead and a little on his chin. It is amazing how a little petal dust can make him look so much more real! Can you see the difference between the dusted and undusted one? Let it set out for a day so it will harden slightly or put in a dehydrator for 30 min or so. You can either place that on top of a swirl of frosting or on a circle of fondant. Just know that with the ears being so big they will hang off the cupcake. If you don’t have a couple days then you should be fine, but the ears will slope down around the cupcake. That is why it is best to make them a few days early. P.S Painting on the eyes works much better than using the food coloring pen. As you can see in the picture above the food coloring pen while trying to get the pupils can get black on other parts of the eyes. But, if that is all you have just be super careful, but expect it not to be perfect.